Reading about the terrible battle in Vietnam's Ia Drang Valley in Hal Moore's book "We Were Soldiers Once... And Young" reminds me of my own comparatively puny experiences of coming under fire in Afghanistan 20-odd years ago. It also reminds me of the horribly realistic first half hour in the movie "Saving Private Ryan." I wonder if having bullets whizzing around your ears is more scary than artillery shells exploding nearby - which is what I experienced. I never faced small arms fire, although a volley of machine gun bullets dug up the ground in front of my feet during the civil war in Lebanon once in June 1985 -- a warning from the Lebanese Forces against my taking pictures. In Afghanistan, on my first trip after the Soviets invaded, I was with Abdul Rasul Sayyaf in Jaji, Paktia Province in late August 1984, two months after the same Sayyaf welcomed Osama Bin Laden in the same area on his first visit to that country. Bin Laden and his men had their baptism of fire under Soviet aerial bombardment in Jaji that time (according to the excellent book "The Looming Tower" by Lawrence Wright) -- they were scared shitless, and Sayyaf and his seasoned Afghan fighters thought those guys were useless. Three years later Bin Laden would become the big Muslim war hero after a battle with Soviet commando forces in the same area. I had my own baptism of fire - so to speak - also together with Sayyaf's men, in a forward base they called Badullah, in a small tent pitched behind a rock at the foot of a range of hills overlooking the high plain near the army garrison Sayyaf's men just named "Chownee," which apparently just means cantonment (perhaps Ali Khel, I don't know for sure - a larger army base a little further out was called Narai). Mujahideen were firing 82-mm mortars from positions just above us into Chownee, and an artillery gun, mortar crews and at least one tank fired back towards us from the garrison. Mortar bombs and artillery shells were exploding close by as I was talking -- actually shouting -- to Commander Mohammed Naim in that little tent. The mujahideen seemed unperturbed by the din and the shaking of the ground under us. They knew we were safe. I was a bit queasy but their confidence made me feel better. At one point a mujahed stepped out of the tent for a second after a mortar bomb explosion very close by and came right back, dropping a very hot piece of shrapnel in front of me. I picked it up later and kept it as a souvenir. Another time, in a camouflaged Dashaka .50 caliber (12.7-mm) heavy machine-gun position a bit closer to Chownee I was with mujahideen who were firing into the army base, trying to hit a building where 7 Soviet advisers were staying, according to Commander Naim (based on info from defectors). I was supposed to fire that gun myself at one point but it jammed. A tank from the base fired a few rounds back at us. The first two fell short but the third one passed just above our heads - so close you could "feel" it - and blew up a tree some 50 meters to the rear. A year later in August 1985 I climbed over high mountains along the Afghan-Pakistani border with a different group of mujahideen (Yunus Khalis) who were planning to attack the exposed Afghan army garrison of Barikot in the Kunar Valley. They fired a total of 17 rockets from a place on the river the fighters called Narei. The response took longer than I expected, indicating to me that the rockets had probably missed their target. The first mortar round from Barikot exploded in the exact location from where the rockets had been fired. You can hear them whistling if they are going to hit some distance away -- not if they come too close. Of course, there was no one left in that place. The next round came quite a bit closer to where I was -- still whistling. They were taking potshots, but they might get lucky and hit us. Another round changed direction a little bit, again, and I thought my cover behind a mud wall might not be good enough. The fourth and last round took out a chunk of the corner of a mud house about 50-60 meters from me. 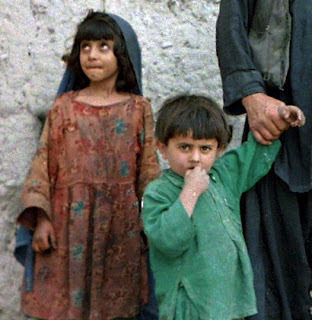 In October 1987 I was in the Kunar Valley again, much further south and perhaps about 8 km or so north of the capital Asadabad and the nearby Soviet air base of Chagha Sarai. I was with Commander Ajab Khan on top of Tari Sar hill, watching as mortar bombs fired by mujahideen in the mountains to the east exploded closer and closer to a small army base called Shigal Tarna just across the fast-flowing river below. The commander used a walkie talkie to direct the crews. Finally one, two, three bombs exploded right in the middle of the base. "Allahu Akbar," resounded the cry of the mujahideen. During the whole time a heavy artillery gun inside the base had kept up a slow but steady fire into the mountains and its boom reverberated through the valleys. But now, suddenly, we "felt" something like a swishing sound in the air above us, and seconds later a hillside to the northeast was covered by plumes of smoke. "Bimsiezda," commented one mujahed. 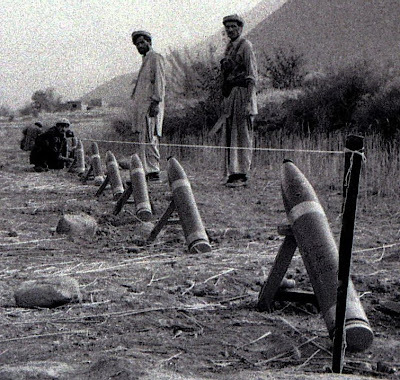 It was a Soviet multiple rocket launcher, firing from the Asadabad area. Shortly after the second rocket salvo whizzed by we were on our way down the hill to get back to the Mujahideen caves and dugouts in the Shultan Valley closer to the Pakistani border. Just before we left the position we saw a helicopter landing in Shigal Tarna, possibly coming to pick up wounded soldiers there. There was no more fire from the mujahideen mortar crews after this but soon the "dooshman" or "shuravi" (enemy) were firing into "our" Shultan Valley from three sides with rocket launchers, field guns and heavy mortars: Asadabad to the south, Shigal Tarna to the west and the Asmar garrison upstream to the north. I don't know if this can be called a barrage but the shelling continued for a long time until late into the night. The ground shook many times under our feet and the sound was frightening once or twice when several very heavy shells exploded close to each other not much more than 100 meters away and lit up the valley. But it seems they did not use airburst munitions because I think some of us would have been blown away. Also surprisingly, there was no air activity, and in fact I never once experienced being under aerial bombardment.